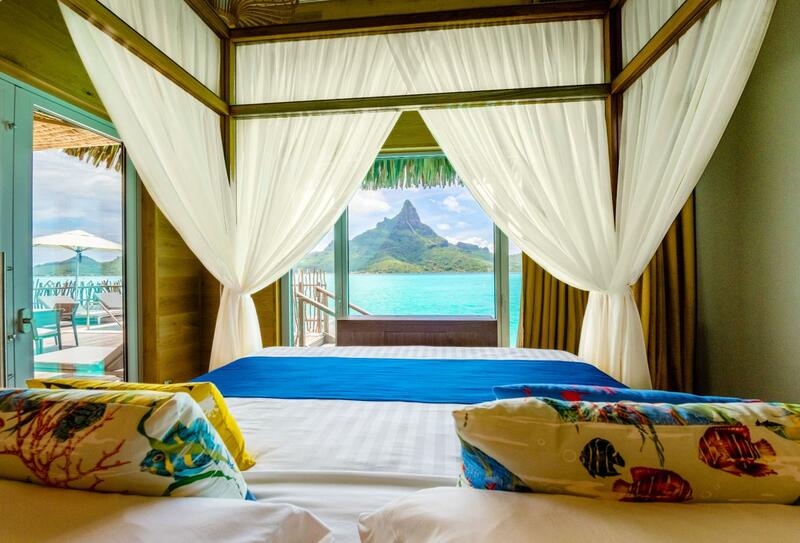 The large Brando Suites Bora Bora are located at the end of the pontoons and offer the most exquisite and uninterrupted views of Mount Otemanu across the azure lagoon. 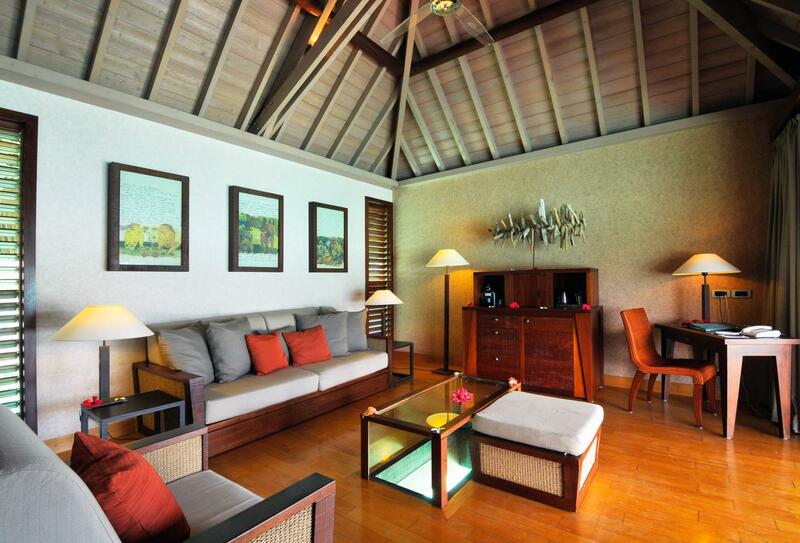 Available in a one- or two-bedroom configuration, they feature modern décor, large outdoor terrace and private pool. The two-bedroom option also offers access to an exclusive solarium on the upper floor. 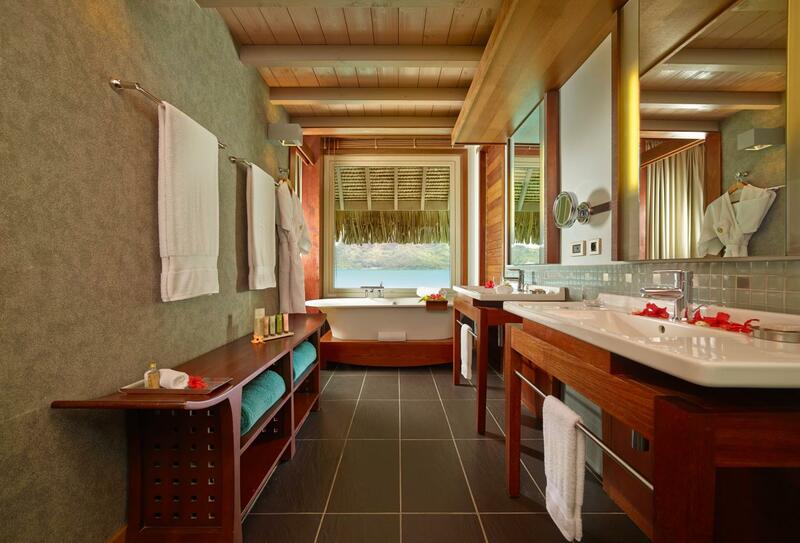 They are the ultimate in luxury for a wonderful honeymoon or family getaway. 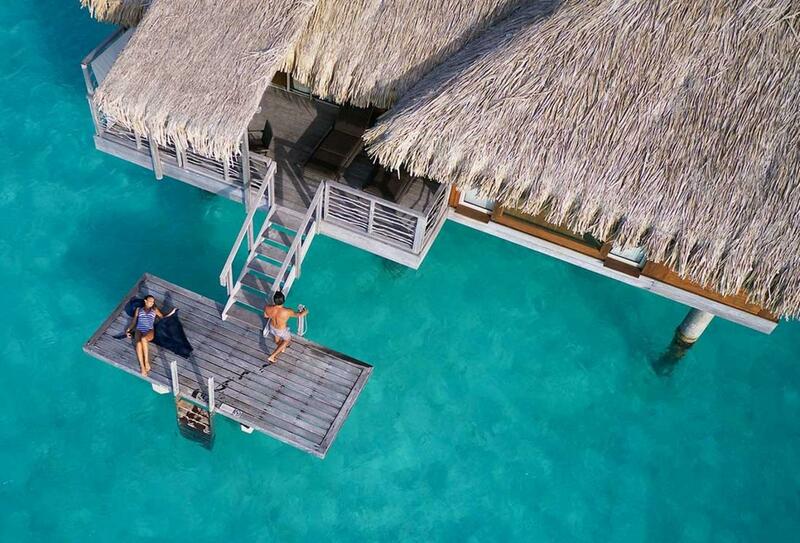 Humbled by the majestic Mount Otemanu, the Diamond Otemanu Overwater Villas features a generous bedroom with plush king-size bed, stylish living area and expansive sundeck with outdoor shower and direct access to the lagoon. 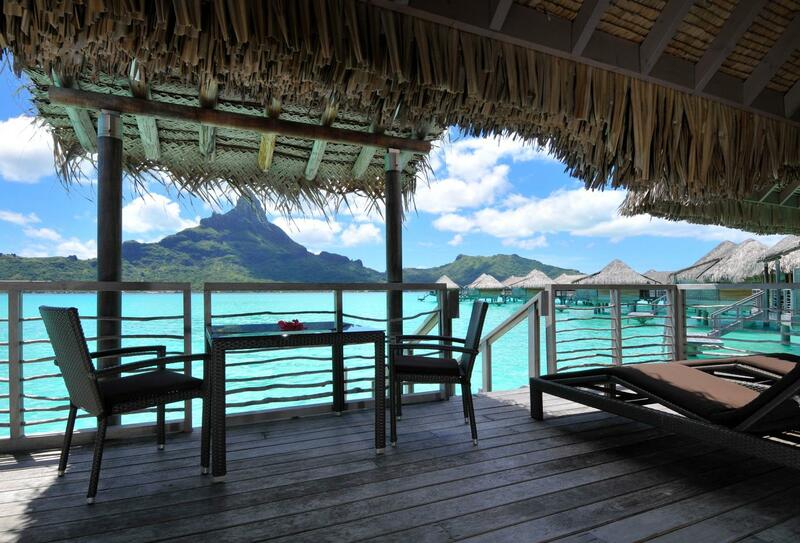 Modern and luxurious with distinct Polynesian décor, the Diamond Overwater Villa boasts spectacular views of Bora Bora’s main island. 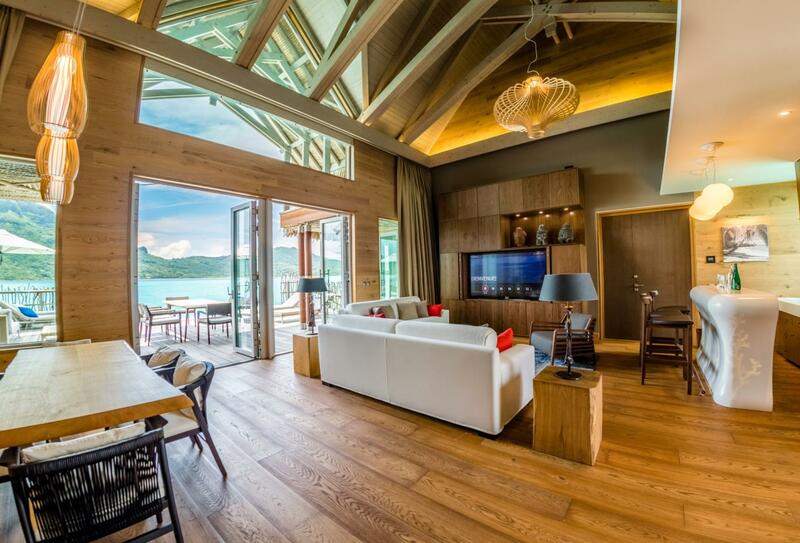 The living room features a glass table that looks down to the waters and fish swimming below, while bathtubs face an additional picture window to soak in the fantastic views. 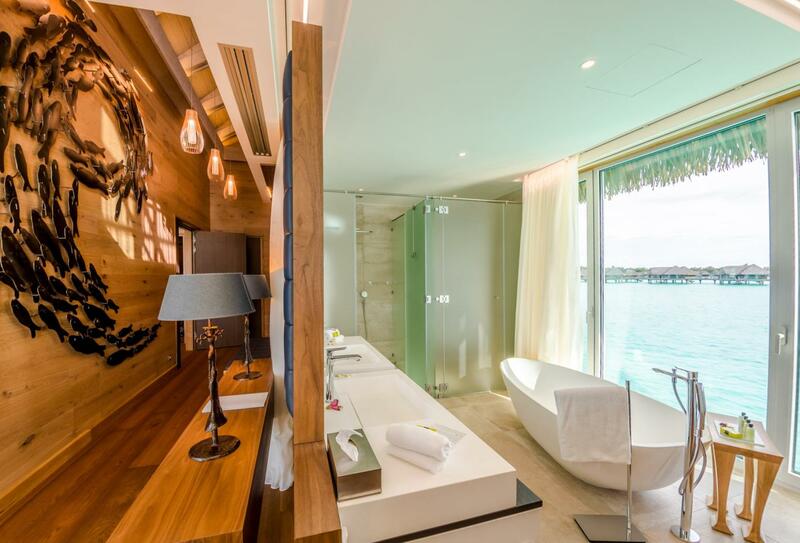 Overlooking the beautiful beachfront and delicately perched over the aquamarine lagoon, the Emerald Overwater Villa features a plush king-size bed, living area with glass coffee table to act as a window to the water below, and a spacious sundeck. 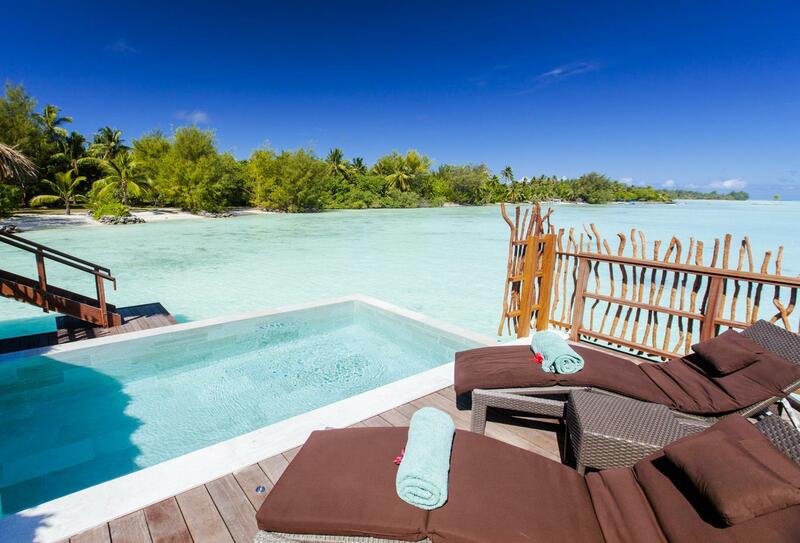 With views of the pristine white sand beaches of the resort, Pool Overwater Villas are fantastic private retreat with their own 17 square meter outdoor pool. A shaded terrace and sundeck complete the large outdoor area while the interior is modern with Polynesian touches, including a glass coffee table in the living area so you can see down to the crystal-clear waters below. 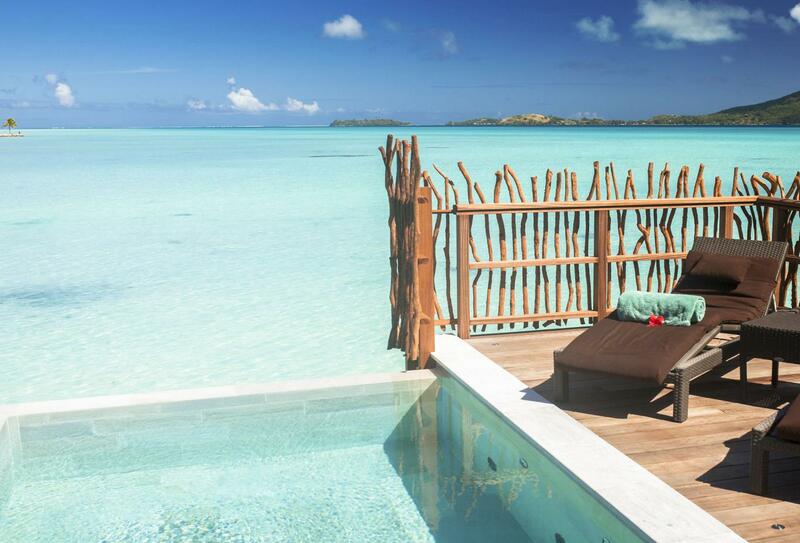 The Pool Premium Overwater Villas offer amazing infinity views to the horizon from a 17 square meter outdoor pool. A shaded terrace and sundeck complete the large outdoor area while the interior is modern with Polynesian touches, including a glass coffee table in the living area so you can see down to the crystal-clear waters below. 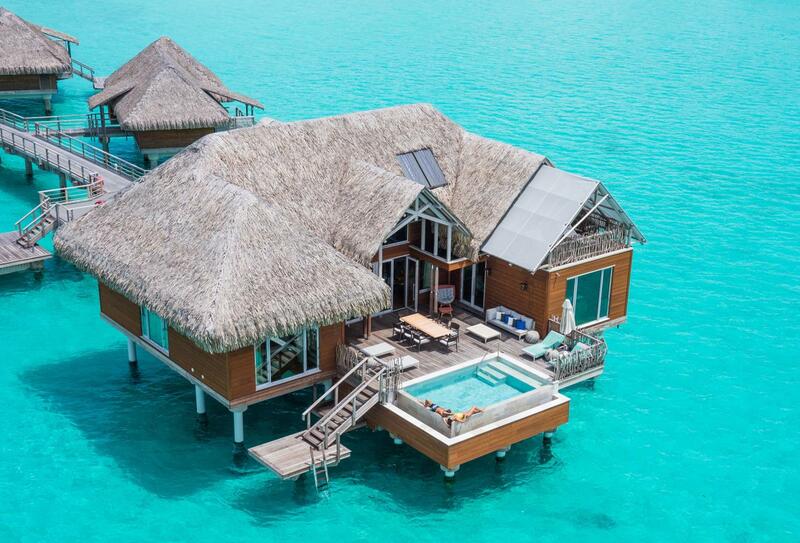 Showcasing fantastic views of the sparkling lagoon, the Sapphire Overwater Villa is a romantic villa with traditional Polynesian design touches. 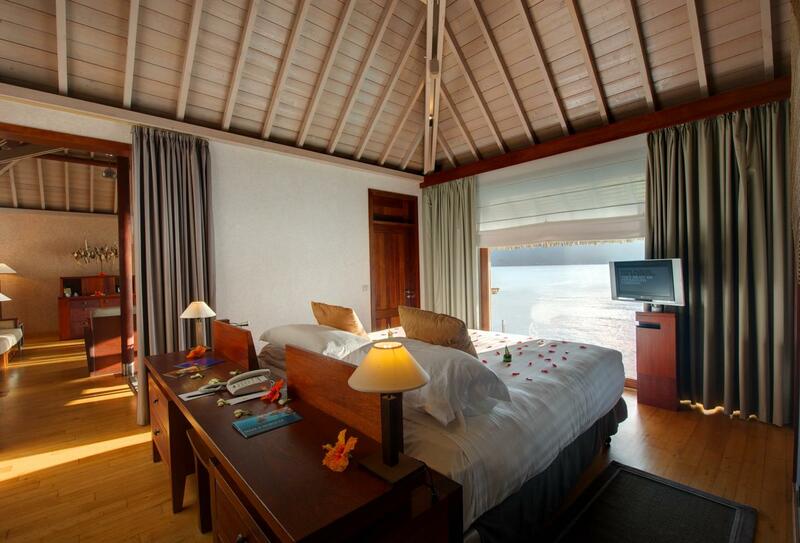 Perfect for a honeymoon, the villa offers direct access to the glistening waters below. Enjoy relaxed, al fresco dining directly on the beachfront at Sands Restaurant. 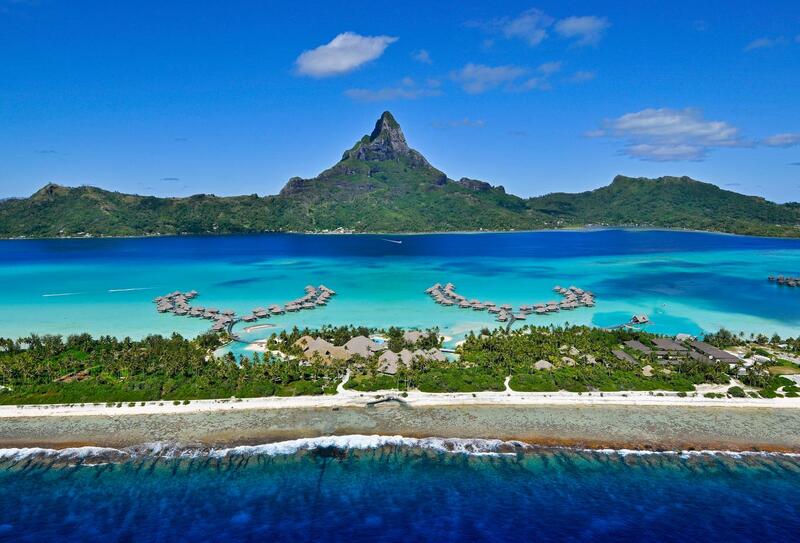 Showcasing breathtaking views of Mt Otemanu and the pristine lagoon, cuisine includes light snacks, grilled international dishes, Asian specialities and beach BBQs on select dates. 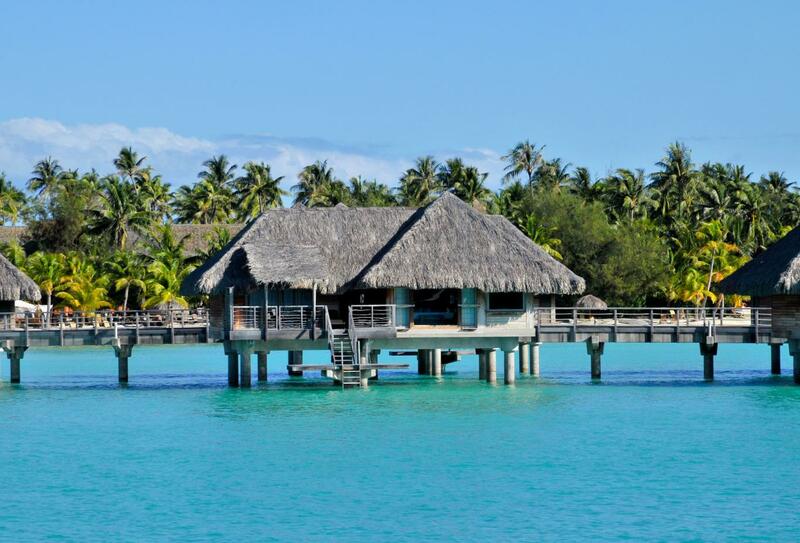 Savour authentic Polynesian and Mediterranean cuisine in an elegant, open-air setting. Traditional French fare and bistro style dishes may be accompanied by Polynesian dances or lavish themed buffets. 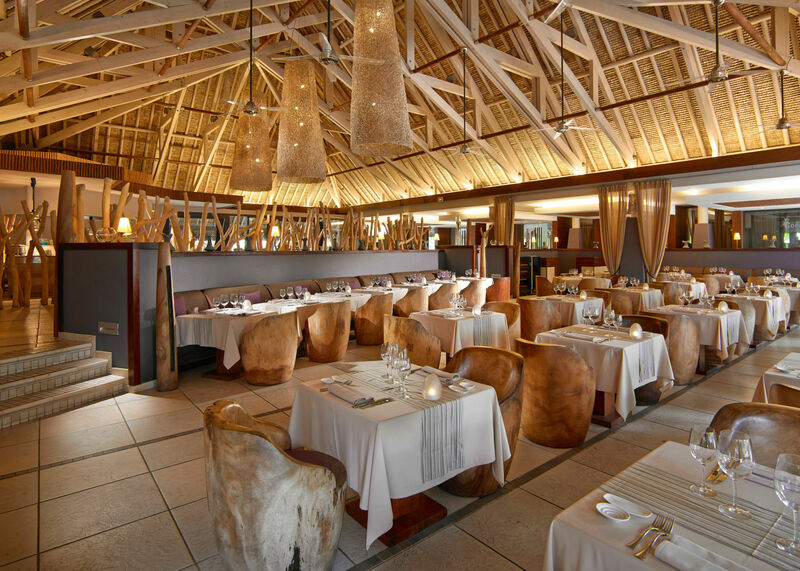 Intimate and romantic, Le Coral Restaurant is the resort’s finest gourmet dining experience, set within an opulent restaurant overlooking a lighted lagoonarium. French cuisine is created by the executive chef and paired with a selection of Old and New World wines from the wine cellar. Distinctly Polynesian in style, with spectacular views of Mount Otemanu, Bubbles offers a wide range of tropical cocktails and cool beverages. Plush sun loungers line the powdery sands at South Beach Bar, serving Polynesian-inspired cocktails, refreshing smoothies, light snacks and meals. A casual all-day eatery on the beautiful beachfront, Sands Bar serves light meals, snacks and a lengthy list of signature cocktails. 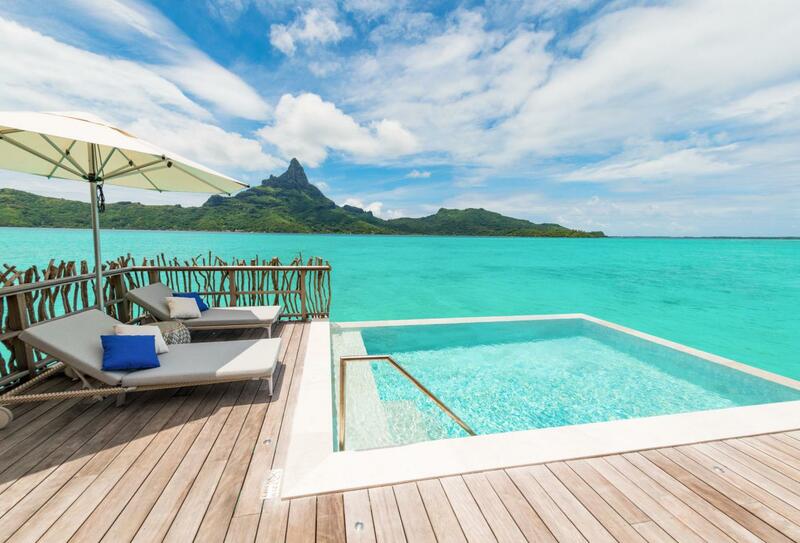 Situated on the idyllic Motu Piti Aau and facing the majestic Mount Otemanu, the Intercontinental Bora Bora Resort & Thalasso Spa is a convenient 20-minute speedboat transfer away from Motu Mute, where the local airport is located. 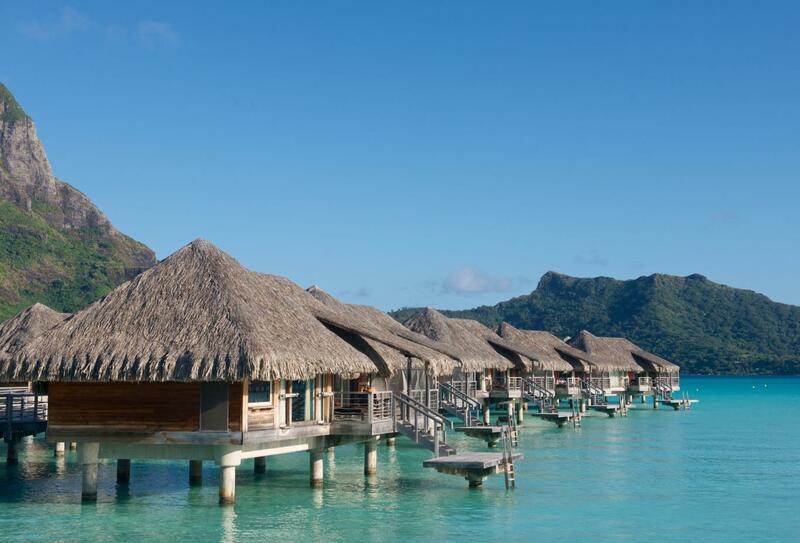 A boat transfer to the InterContinental Bora Bora Le Moana Resort, located on Matira Beach, is also available and puts you within easy reach of market stalls, shops, restaurants and art galleries.